The Vacuum Technology Laboratory of Univac was founded with a purpose of improving the performance of the products and developing new equipments in 2001. 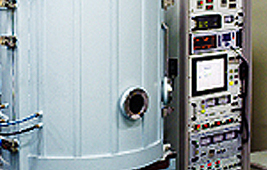 Focusing on manufacturing the vacuum equipments and developing techniques of thin film deposition, the Laboratory is performing research and development of a variety of advanced vacuum systems and accessories. The optical thin films are made by depositing selectively oxides such as SiO2. TiO2 and metals such as Al, Ag. In order to fabricate the optical devices with peculiar characteristics such as AR/BBAR, BS/PBS, Band Pass Filter, Mirror, sound and elaborate design skill of optical thin films and the vacuum system equipments is required. The Vacuum Technology Laboratory of Univac has long-term experience and fabrication techniques in optical thin films and vacuum system. All products are quality controlled and provided to customers after thorough test by our research staff. We produce various types of electron gun, which is a fundamental part for evaporation deposition system. Among our product, there is End-Hall type ion source, which improves the problem of phase shift and provides wide angle of beam irradiation, and achieves high level of ion current. This equipment is especially adequate for the deposition of optical thin films. For depositing multi-layer coating such as in optical filters, the improvements in the cohesiveness between layers, the refractive index, and the phase shift problems are required. Also the stability of the deposition source should be maintained. Due to the temperature rise of the substrate, a thermally unstable material like plastic should not be used. The RF plasma source which was developed by the Vacuum Technology Laboratory of Univac is very useful meeting these criteria. Utilizing RF type beam source, it achieves high level of beam currents with low power. It also can adjust the energy of ion beam by controlling the grid voltages thus fulfilling the requirements for depositing high- quality optical thin films. We develop a variety of vacuum equipments and thin film deposition systems and the vacuum accessories for the manufacture company and research laboratory of academic institute. We have kept strong research collaboration programs with the institutes and universities and have been improving the technology in this field. - IBAD system. - Electron beam evaporation system. - CVD / PVD system. - DC / DC pulse / RF magnetron sputtering system. - Ion beam sputtering system. - UHV chamber for surface analysis.